A rendering by Verges Rome architects of the new Sci High campus on Bienville Street in Mid-City. 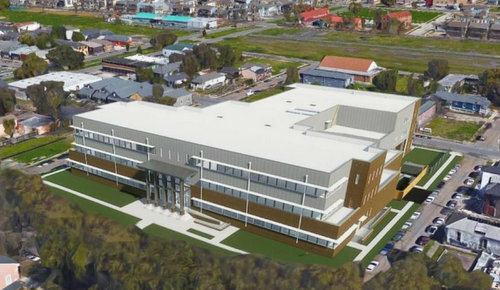 The New Orleans Charter Science and Mathematics High School is anticipating a fall groundbreaking on its new, state-of-the-art campus in the biomedical corridor in Mid-City, school officials said Thursday evening. The long-promised new campus for the school will be at 2011 Bienville Street, one block from the Lafitte Greenway and two blocks from the University Medical Center. After a groundbreaking in the fall, construction is expected to take about two years, making a best-case scenario for move-in during the winter break of 2020, said principal Chana Benenson at a board meeting Thursday evening. Sci High officials were able to request special design for a number of classrooms unique to the school’s curriculum. The building will have engineering classrooms, biomedical laboratories, computer centers, fabrication studios, and an outdoor construction area for larger projects. The second-floor gym will have 400 bleacher seats and a stage, a far better assembly point than anything the current campus offers, Benenson said. The cafeteria will have both an outdoor seating area and a large, tiered “learning staircase” that can also be used for amphitheater-type seating during small presentations, she said. The new school will be much more secure than the current building as well, with the main office the only point of entrance during the day. For after-school activities, areas such as the gym, cafeteria or library can be accessed individually, while the rest of the school remains locked. Sci High currently enrolls nearly 470 students in grades 9 through 12, and next year will expand enrollment slightly in each grade for a target of 500. The new campus will have room for 650 students, and while the current building on Loyola Street can not hold that many, the goal is to gradually grow in the direction of 650, Benenson said. “We’re not making any large leaps — just a few extra kids in each grade,” Benenson said. The school district is paying for construction of the building and will keep ownership of it, but Sci High is responsible for furnishing it with the technology and engineering machinery that will accompany the programming. The school’s board has launched a $1 million capital campaign to help pay for those expenses in conjunction with the school’s 25th anniversary. Sci High has had consistently strong growth in its School Performance Scores in recent years, earning a 98.7 for a B rating in 2017. The school has the highest ACT scores for an open-enrollment school in New Orleans, Benenson said.